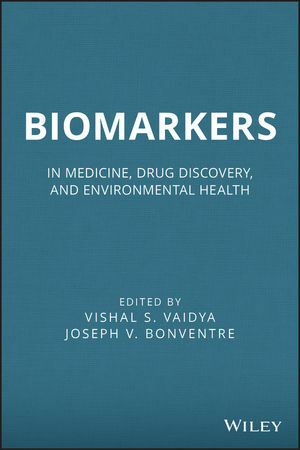 This book provides an introduction to the field of biomarkers, how they have been and can be used, and how different approaches can be used to identify, characterize, and monitor biomarkers. The book has chapters on topics including HIV, Cancer, Parkinson’s, vascular injury, environmental exposure. A following section discusses the technologies (diagnostics and assays) to detect biomarkers and authors have emphasized the preclinical and clinical manifestation of the injury/disease process. VISHAL S. VAIDYA, PhD, is an Assistant Professor of Medicine at Harvard Medical School in the Renal Division of Brigham and Women's Hospital. He directs the Laboratory of Kidney Toxicology and Regeneration with a research emphasis on discovery and evaluation of biomarkers and biosensors for early detection of kidney injury and investigates the molecular mechanisms of kidney tissue repair. Dr. Vaidya has authored more than thirty-five original research articles and twelve chapters and reviews. He serves as a councilor for the northeast chapter of the Society of Toxicology and is an elected member of Harvard School of Public Health's Center for Environmental Health. He is the recipient of the Pathway to Independence grant by the National Institute of Environmental Health Sciences. JOSEPH V. BONVENTRE, MD, PhD, is the Samuel A. Levine Professor of Medicine at Harvard Medical School. He is also Chief of the Renal Division and Director of the Biomedical Engineering Division of Brigham and Women's Hospital and is President-elect of the American Society of Nephrology. He has authored more than 250 original papers and 120 chapters and reviews. His research focuses primarily on the study of kidney injury and repair and signal transduction, with special emphasis on the role of inflammation, biomarkers, and stem cells. Bonventre has received a MERIT award from the National Institute of Diabetes and Digestive and Kidney Diseases. 6 Biomarkers of Alzheimer's and Parkinson's Disease (Walter Maetzler and Daniela Berg). 9 Translational Biomarkers of Acute Drug-Induced Liver Injury: The Current State, Gaps and Future Opportunities (Josef Ozer, William Reagan, Sheli Schomaker, Joe Palandra, Mike Baratta and Shashi Ramaiah). 11 In Search of Biomarkers for Drug-Induced Vascular Injury (James R. Turk). 16 Biomarkers of In Vitro Drug-Induced Mitochondrial Dysfunction (James A. Dykens and Yvonne Will). 17 Immunoassay-Based Technologies for the Measurement of Biological Materials Used for Biomarkers Discovery and Translational Research (Vincent Ricchiuti). 19 Immunodiagnostics with a Focus on Lateral Flow Point-of-Care Devices (Roy R. Mondesire, Glen M. Ford, Hannie F. Ford, and Stephen C. Mefferd).